VivaTech provides a “turn-key” solution for the clinician to obtain StroMed from adipose tissue. VivaTech can provide you and your nurses with StroMed technology and training, to perform the whole process (using our autologous ultrasonic cavitation separation process) in your own surgery center. Our technique can be completed in just 30 – 40 minutes. 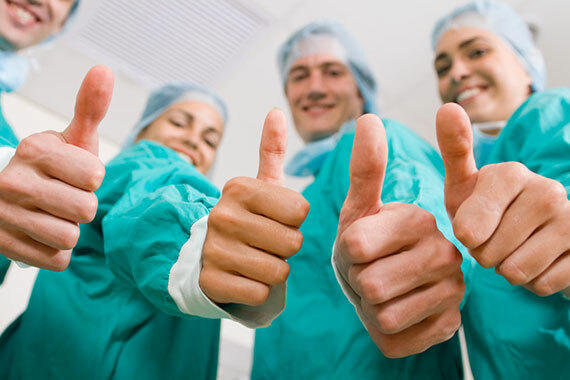 What we have to offer is a package that includes licensing, surgical equipment, initial education and full ongoing support to extract StroMed from adipose tissue and treat your patients. Our technology is highly efficient, cost effective and provides a much higher stem cell count than traditional stem cell extraction methods. However, in order to prove that VivaTech’s end product contains Mesenchymal Stem Cells (MSCs), the following University Study was conducted where culturing was used. The International Society for Cellular Therapy has defined a minimal criteria for bone marrow or other tissue MSCs. Independent University Studies on Stem cell Viability (live cells) and Differentiation on StroMed separation by Australian patented Sonication protocol. Independent University studies have validated Cell-Innovations (VivaTech) sonication protocol to obtain viable, adherent cells capable of mitotic division and differentiation indicative of mesenchymal stem cells. 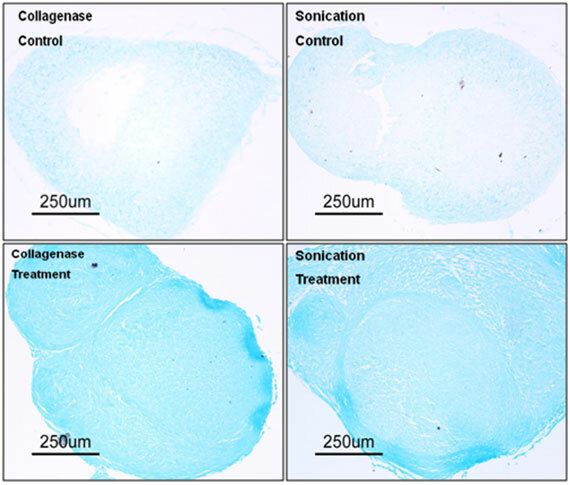 There were no differences between collagenase digestion and VivaTech sonication protocol in terms of cell population doubling time, freeze-thaw viability, or differentiation into either bone or adipose tissues. The old methods of collagenase separation of adipose to StroMed are shown below in comparison to sonication separation of StroMed in the University study below. Cells viable and cultured from adipose StroMed. Adipose derived StroMed after 5 days in culture at 40x magnification. 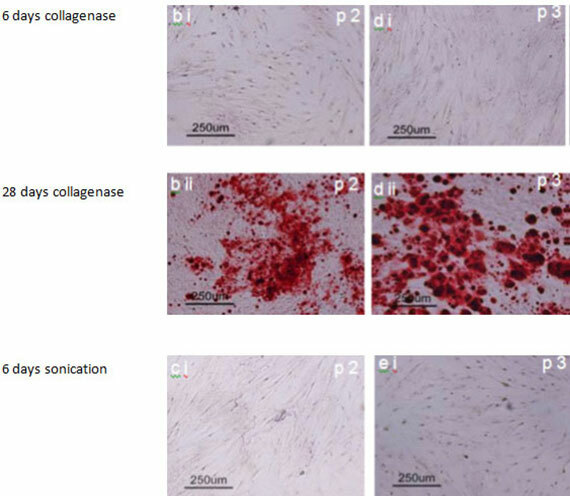 Images obtained of cells isolated from patients using collagenase correspond to: a, c, and e, respectively. 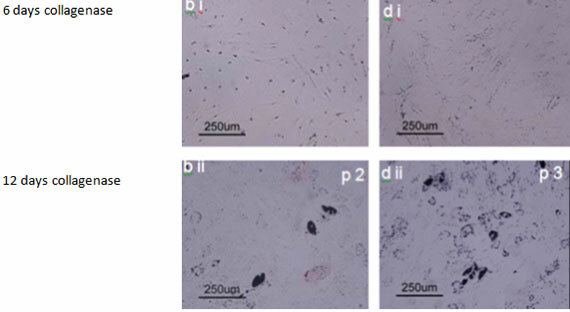 Images obtained of cells isolated from patients using sonication correspond to: b, d, and f, respectively. Osteoblastic (bone) differentiation of stem cells are typically tested by staining with Alizarin red which indicates calcium-rich deposits. Adipose derived StroMed cells cultured in osteogenic media for 28 days (bii- eii) or control media for 6 days (bi- ei) from patients and stained with alizarin red. The stain alizarin red Images at 100x magnification. Images b, and d were obtained from cells isolated using collagenase method. 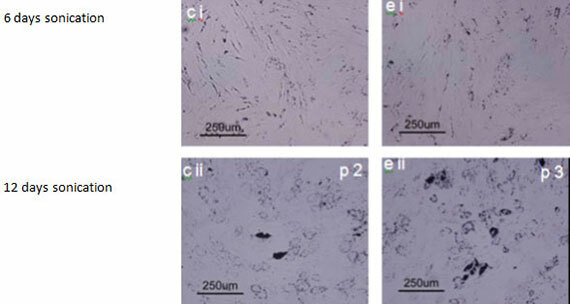 Images c, and e were obtained from cells isolated using StroMed sonication. Adipogenic (fat cell) differentiation of mesenchymal stem cells are typically tested by staining with Oil Red O which stains triglycerides (intracellular lipid vesicles) indicative of adipocyte (fat) cells. Adipose derived StroMed cells cultured in adipogenic media for 12 days (bii- e ii) or control media for 6 days (bi- ei) from patients and stained with oil red o. Images at 100x magnification. Images b, and d were obtained from cells isolated using colagenase method. Images c, and e were obtained from cells isolated using sonication. Chondrogenic (cartilage) differentiation of mesenchymal stem cells results in formation of cartilage with a typical extracellular matrix. A key molecule besides collagen type II within this extracellular matrix is the proteoglycan aggrecan. Alcian Blue (a blue copper containing dye) can detect aggrecan an indicator of cartilage formation. Vivatech’s licensed sonication protocol uses ultrasound cavitation to extract the adipose-StroMed from adipose tissue. Unlike other methods of stem cell therapy, the major advantage of using the VivaTech process is the ease and speed of processing (within 30 minutes). Most significantly, there is no use of chemicals and enzymes, such as collagenase, making our process cleaner and safer. VivaTech will license the ultrasonic cavitation technology to doctors and clinicians throughout the US. VivaTech is now hosting clinical trials. Contact VivaTech for information regarding local clinics in your area to see if you qualify. Here is a case series that discusses the licensed stem cell protocol used by VivaTech USA. By using VivaTech you will be implementing highly efficient technology that is cost effective and provides a much higher stem cell count compared to other traditional stem cell extractions. By taking part in clinical trials you will be helping advance the current knowledge base and also establish your clinic as a pioneer in advanced treatment options. With ground-breaking data, information and technology consistently becoming readily available to medical practitioners on a daily basis, it’s important for doctors worldwide to keep up to date with the latest in modern medical treatments. That’s why understanding and implementing stem cell technology is a necessary step towards the future of medicine. Although they are found throughout the body, stem cells are primarily located in the fat cells and bone marrow. There are a few different methods of extracting and using these cells, but here at VivaTech we offer our clients the latest in innovative technology and training that assists in the extraction and restructuring of adipose tissue (commonly called fat) into StroMed. Both bone marrow and adipose tissue offer useful stem cells, but adipose tissue is much more accessible and can be used as a source of stem cells throughout a lifetime. Adipose tissue (fat) presents a range of benefits over traditional extracted stem cell materials. Stem cells can be derived from embryos (embryonic stem cells) or from adult tissues. They are undifferentiated cells found among differentiated cells. The primary role of adult stem cells are to maintain and repair the tissue in which they are found. Over the past three years in trials conducted in Australia, clinics have followed up on hundreds of patients. The majority of these patients have had positive outcomes. How Does Adipose Tissue Get Extracted and Perfected? The adipose tissue is carefully removed through a mini-liposuction procedure. Then, with the right tools, technology and training, doctors are able to refine the adipose tissue to remove specific cells which are beneficial to the body. This process of refinement is called ultrasonic cavitation which separates the useless tissue. The remaining cells are known as (StroMed) cells and they are vital for a successful regeneration process. As an efficient and cost effective alternative to lengthy cultivating techniques and technologies used in the past, VivaTech is able to provide a much greater stem cell count essential to assist the regeneration process for the affected area. Different technologies that separate out StroMed may produce different outcomes, and that is why VivaTech uses a particular type of StroMed. What Does it Have to do With Arthritis? As a support to the repair and regeneration of tissue, StroMed is able to provide a stimulant to the affected area. If the patient was suffering from arthritis in the knee joint for example, the new cells would encourage reduced inflammation and pain, and aid in the repair and regeneration of the joint. To find out more about the uses of StroMed and how VivaTech is committed to providing quality and up-to-date equipment and service, contact our office at 855-984-8287 today, to find out how your practice can provide ground breaking technology for your patients.